Teams look to their best players to help carry them through the season’s defining moments. In the biggest game of the season, St. Olaf asked Tulsa Douglas to help win the team’s first National Championship. She answered. Douglas scored or assisted every single one of St. Olaf’s 11 goals in their victory over Bates in the final. The final tally: two goals and nine assists, with Bates doing everything they possibly could to slow her down. It was a tremendous effort from the best player in the division. What made Douglas’ performance so memorable, beyond the sheer, staggering stat line, was how nonplussed she was by the whole thing. 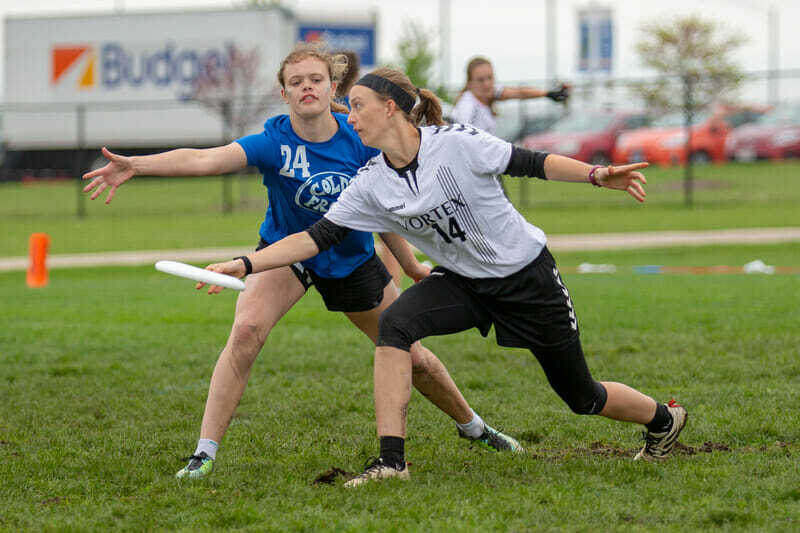 Whether she was obliterating her matchup in the handler space to get the disc every other throw, or launching perfect hucks to her cutters downfield, Douglas barely seemed bothered by the moment or the load she was carrying for her team. Her unburdened expression only broke for a few smiles to celebrate her teammates’ plays and once St. Olaf had clinched the victory. Douglas was so in the zone, she said after the game that she wasn’t aware that she’d scored or assisted every point. She may not have been aware of the perfect game she was throwing, but her opponents certainly were. Bates threw the kitchen sink at Douglas trying slow her down. Several different players took a crack at marking Douglas, but for the most part it was a lost cause. Josie Gillett, Bates’ best player on the weekend, took her turn to start the second half and Bates immediately got two breaks. Douglas only committed one turnover on those points, but Gillett was able to take options away from Douglas that some of her teammates couldn’t. On the third point of the second half though, Gillett was late setting the mark on Douglas after pulling and Douglas took advantage by dropping in a perfect backhand huck for a one throw score. Gillett continued to mark Douglas for much of the second half, and she actually got a hand block on her at 9-8. It was a startling reminder of Douglas’ mortality given the game she was having, but it was the last imperfection in her performance. Even with Gillett slowing Douglas down better than anyone else had, Douglas maintained her casual mannerisms and continued to score or assist every goal her team scored. Douglas was undeniably spectacular, but her teammates’ performance need to be mentioned as well. Kaitlyn Mulhern, the tournament’s leading goal scorer, registered four goals and caused havoc in the deep space all game long. Aidan Zielske was a dependable presence alongside Douglas in the backfield, and the rest of St. Olaf’s depth played their roles well. It may not have felt to Douglas like had the massive game that she did, but it was apparent to those who were watching. It also should be mentioned that the final was the third time on the weekend that Douglas directly contributed to all her team’s scores, so maybe she’s just so used to that feat it barely even registers as significant to her. But what Douglas did in the season’s grand finale inked her spot in the game’s history books and etched out a special place in ultimate’s lore. It was a titanic performance from the division’s best player. The most impressive aspect of all? She was barely aware she’d even done it. Comments on "Tulsa Douglas: In The Zone"